Jeeves and Wooster is a British comedy-drama series adapted by Clive Exton from P. G. Wodehouse's "Jeeves" stories. The series was a collaboration between Brian Eastman of Picture Partnership Productions and Granada Television. Stephen Fry (left) as Jeeves and Hugh Laurie as Bertie Wooster. It aired on the ITV network from 22 April 1990 to 20 June 1993, with the last series nominated for a British Academy Television Award for Best Drama Series. It starred Hugh Laurie as Bertie Wooster, a young gentleman with a "distinctive blend of airy nonchalance and refined gormlessness", and Stephen Fry as Jeeves, his improbably intelligent and bold valet. The stories are set in the United Kingdom and the United States in an unspecified period between the late 1920s and the 1930s. Wooster is a bachelor, a minor aristocrat and member of the idle rich. He and his friends, who are mainly members of The Drones Club, are extricated from all manner of societal misadventures by the indispensable valet ("gentleman's personal gentleman") Jeeves. When Fry and Laurie began the series they were already a popular double act due to regular appearances on Channel 4's Friday Night Live and their own show A Bit of Fry & Laurie (BBC, 1987–95). In the television documentary Fry and Laurie Reunited (2010), the actors, reminiscing about their involvement in the series, revealed that they were initially reluctant to play the parts of Jeeves and Wooster but eventually decided to do so because the series was going to be made with or without them and they felt no one else would do the parts justice. 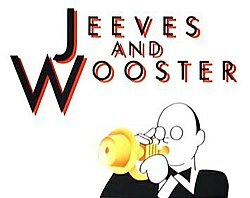 The theme (called "Jeeves and Wooster") is an original piece of music in the jazz/swing style written by composer Anne Dudley for the programme. Dudley uses variations of the theme as a basis for all of the episodes' scores and was nominated for a British Academy Television Award for her work on the third series. Many of the programme's supporting roles – including significant characters such as Aunt Agatha, Madeline Bassett and Gussie Fink-Nottle – were played by more than one actor. One prominent character, Aunt Dahlia, was played by a different actress in each of the four series. Francesca Folan played two very different characters: Madeline Bassett in series one and Lady Florence Craye in series four. The character of Stiffy Byng was played by Charlotte Attenborough in series two and by Amanda Harris in series three and then by Attenborough again in series four. Richard Braine, who took over the role of Gussie Fink-Nottle in series three and four, also appeared as the conniving Rupert Steggles in series one. Four series were produced, with 23 episodes in total; each series but the first consisted of six episodes, with all being broadcast each spring from 1990–93. The five episodes of the first series were directed by Robert Young and first aired in April and May 1990. The second series, directed by Simon Langton, aired in April and May 1991. The third series, directed by Ferdinand Fairfax, aired from March to May 1992. Fairfax also directed the six episodes of the fourth and final series, which initially aired in May and June 1993. The third series of Jeeves and Wooster won a British Academy Television Award for Best Design for Eileen Diss. The final series won a British Academy Television Award for Best Graphics for Derek W. Hayes and was nominated for a British Academy Television Award for Best Drama Series; it also earned a British Academy Television Award for Best Original Television Music for Anne Dudley and a British Academy Television Award for Best Costume Design for Dany Everett. In retrospect, Michael Brooke of BFI Screenonline called screenwriter Clive Exton "the series' real star", saying his "adaptations come surprisingly close to capturing the flavour of the originals" by "retaining many of Wodehouse's most inspired literary similes." Granada Media released all four series on DVD in Region 2 between 2000 and 2002. On 1 September 2008, ITV Studios Home Entertainment released Jeeves and Wooster: The Complete Collection, an eight-disc box set featuring all 23 episodes of the series. In Region 1, A&E Home Video released the entire series on DVD in the US and Canada. In Region 4, Shock Entertainment has released the entire series on DVD in Australia. It was initially released in season sets in 2007/2008, followed by a complete series collection on 4 August 2008. Interior shots of Skeldings Hall (Bobbie Wickham's house) were filmed at Home House, a historic house in London. Totleigh Towers was filmed at Highclere Castle, Hampshire. Other location shots of "Trouble at Totleigh Towers" were filmed at West End, Waltham St Lawrence, Berkshire. Exterior shots of Brinkley Court were filmed at Barnsley Park, Gloucestershire in series 1 and Hall Barn, Buckinghamshire in series 4. All interior shots of Brinkley Court were filmed at Wrotham Park, Hertfordshire. Interior and exterior shots of Chuffnell Hall, in series 2, were also filmed at Wrotham Park. Chuffnell Regis Station shots were filmed at Horsted Keynes station – Bluebell Railway, Sussex. Ditteridge Hall ("Jeeves Takes Charge") was filmed at Englefield House, Berkshire. Twing Hall ("The Purity of the Turf") was filmed at Stanway House, Gloucestershire. The "Victoria Hotel" and the "Hotel Riviera" in Westcombe-on-Sea ("Pearls Mean Tears") were filmed in Sidmouth, Devon. Some of the exterior shots in the gardens of the estate in "Jeeves in the Country" are filmed at Polesden Lacey, Surrey. Barmy's Aunt's House ("Kidnapped!") was filmed at Clandon Park, Surrey. Deverill Hall ("Right Ho, Jeeves") was filmed at Joyce Grove, Oxfordshire. Fothergill Hall ("Comrade Bingo") was filmed at Dorney Court, Buckinghamshire. Lord Worplesdon's New York City residence ("The Once and Future Ex") was filmed at Gaddesden Place, Hertfordshire. Exterior shots of Stuyvesant Towers, Wooster's residence in New York City in series 3 and 4, were filmed at Senate House in Bloomsbury, the central library and administration building for the University of London. Exterior shots of Berkeley Mansions, Wooster's residence in London, were filmed at 2 Mansfield Street, Marylebone. ^ Laurie also addressed that issue in an article he wrote about Wodehouse's impact on his life "Hugh Laurie: Wodehouse Saved my Life". The Daily Telegraph. 25 May 1999. Retrieved 7 February 2018. ^ "The World of Jeeves & Wooster - Original Soundtrack". annedudley.co.uk. Retrieved 3 December 2009. ^ "Jeeves and Wooster – Complete Collection [DVD]: Amazon.co.uk: Stephen Fry, Hugh Laurie, Robert Daws, Richard Dixon, Mary Wimbush, John Turner, John Woodnutt, Michael Ripper, Francesca Folan, Elizabeth Heery, Richard Braine, Richard Garnett: Film & TV". Amazon.co.uk. Retrieved 31 December 2014. The Russian Wodehouse Society—Episode guides, screenshots and quotes from the four series.